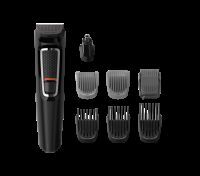 2 stubble combs (1,2 mm) , 1 adjustable beard comb (3-7 mm), 3 hair combs (9,12,16 mm) and 2 body combs (3,5 mm). To Recieve updates and possible rewards for Philips MG7715/15 please sign in. To Recieve updates and possible rewards for Trimmer, Clipper & Shaver please sign in.